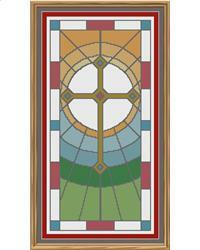 Inspiration for this design has been taken from a stained glass window that I saw in a California church. Perfect for anyone with a little faith in their lives, the colours used really draw the eye to the cross in the centre. This is a tall, narrow design. I recommend using evenweave fabric, as there are a lot of fractional stitches in this design, and this piece would be best suited to a stitcher with some experience. It would look good stitched on a lightly coloured fabric too if that is your preference.